In November 2012, as a result of being diagnosed with major spinal stenosis and being advised that surgery would alleviate the condition, Merrill elected to undergo back surgery. This elicited a major change in his life as complications arose from the procedure in the form of severe nerve impairment from his waist to feet in both legs. To complicate things further, the day after surgery, Merrill experienced a coronary myocardial infarction, resulting in an immediate triple by-pass. After a lengthy stay in the hospital, Merrill required three months in the Madonna Rehabilitation facility and participated in Physical Medicine and Rehabilitation for several weeks. He did not walk unassisted for about seven months and then entered the Mayo Cardiac Rehabilitation program in June 2013. From there, he went on to successfully complete the program. Additionally, Merrill has been working with a DAHLC wellness coach, Terri Wheeldon, on a weekly basis since June 2013. He has had a recent cardiovascular reevaluation showing a strong recovery. His provider noted that the more active he is in participating in these wellness activities, the better his health outcomes will continue to be regarding muscle tone, strength and physical cardiovascular fitness. When asked about his outlook now, Merrill stated, "In my case with two major surgeries and the complete loss of my lower extremities (a paraplegic), the complexion of my recovery was dismal. The Mayo Cardiac Rehab Program was an inspiration for me to seek further rehab possibilities. 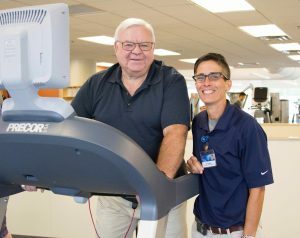 The recommendation to continue a rehab program (Adaptive 2) at the DAHLC has provided a successful and rewarding recovery, enabling me to walk. As noted by my providers, this will probably require a continued participation in this program. Due to the success over the past four years of my rehabilitation, I feel fortunate to have participated in all the rehab programs and especially the DAHLC Adaptive 2 Program provided by wellness coach, Terri Wheeldon." Wow! What an incredible comeback from such unfortunate health events. Way to go, Merrill! You are a fighter!